Books on design of pipelines, and equipment such as pumps and compressors are available but almost none on the piping that carries fluid to and fro. 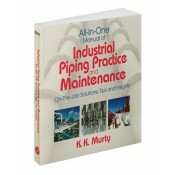 This practical, no-frills book offers complete coverage of piping practices and maintenance all in one place. Written by a professional with 35 years of hands-on knowledge and experience in pipeline building, operating, and maintenance, this manual is designed to be kept at the ready, on the shop floor. Maintenance engineers and managers will wonder how they've survived so long without it! • Features practical insight and valuable notes. • Uses charts and spec sheets wherever necessary instead of calculations and formulas. • Provides problems, precautions, and troubleshooting tips. • Extensive use of photos enables users to understand what they need to know.